What Is the Size of a Youth or Junior Basketball? To ensure youth basketball players are successful and safe while playing the game, you'll need to provide them with the proper equipment. Among the items needed for basketball is the right sized ball for the age and size of the children partaking in the game. 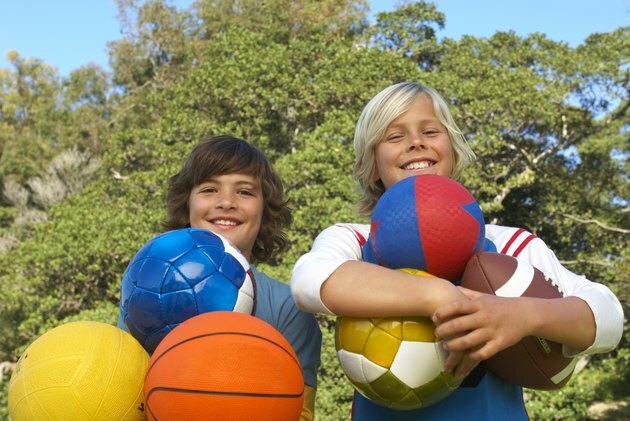 Basketballs come in a variety of sizes and weights. A mini size basketball is listed as a size 3 or 4. It measures 22 to 24.5 inches in circumference and is designed to be used by small hands. This size ball is ideal for youth players, 8 years old and younger, that are first starting out, learning to dribble and take some shots. Junior, or size 5, basketballs measure 27 to 28.5 inches and weigh between 14 and 16 ounces. This size ball is often used by girls and boys, ages 8 to 12, in recreational league games. Children over 8, middle school girls, high school girls and women normally use a size 6. This is an intermediate ball for playing basketball. This ball is also often referred to as an official women's ball, since it's made specifically to fit the generally smaller hands of the women's game. An intermediate ball measures between 28.5 and 29 inches and weighs 18 to 20 ounces. Boys, of middle school to high school age generally use a size 7 basketball, also known as a regulation or official size ball. This is the same size ball used by college and professional men's basketball teams. It measures 29.5 to 30 inches and weighs between 20 and 22 ounces. When Do Kids Move to Size 5 Soccer Balls?